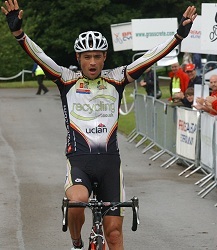 The latest round of the season long Premier Calendar competition, the Ryedale GP sponsored by Grasscrete was won today by Chris Newton (Recycling.co.uk) after 115 miles around the lanes of North Yorkshire. 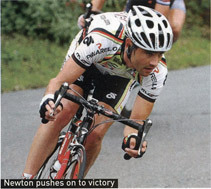 Newton was part of a small group of three that escaped with still 50k ilometres to go and from that, he countered an attack by Matt Stephens (Sigma Sport), and despite Russell Downing making a huge effort to get him back, Newton held on to win by a few seconds as he crossed the line in the historic Duncombe Park. Grippy – the only word I can think of to describe just how hard the 115 mile Ryedale Grand Prix sponsored by Grasscrete was in North Yorkshire on Sunday. The course is deceptively hard and no more so than in Sunday’s race when the pace of the race tore the field apart within the first hour and with 50 kilometres to go there were only three riders left in the hunt for the win, Matt Stephens, Russell Downing and Chris Newton. The race started at Ampleforth College, a 10 minute or so ride from the very historic and picturesque Duncombe Park estate where the race was starting from. A few technical hitches meant the riders were late leaving the headquarters but with the sun shining during the neutralised zone, everyone was happy enough with lots of chit chat going on and smiles as we cruised past on the motorbike. Russell Downing was looking concerned though with his rear freehub, thinking it might be ceasing up when he stopped pedalling but it was to be okay during the race. Once at the lovely Duncombe Park with its stately home, acres of green grass and a castle ruin just down the road, the riders lined up and the leaders in the British Cycling Premier Calendar, Chris Newton, Dean Downing etc, were introduced to those hardy souls that lined the barriers. Once under way, as always, within seconds of the flag having been dropped to signal the start of the race outside Helmsley, the attacks started. We, my motorcycle pilot and I, gave them a few minutes to get active and dropped back and there was Tom Murray of Kinesis attacking and dragging a group away. A short while later it was coming back together but he attacked again and soon a small group of six including Murray, Matthew Cronshaw (SiS/Trek), Alex Higham (Rapha Condor), Peter Hey (West Pennine Wh) and Dafydd Dylan (KFS Special Vehicles) had opened up a good gap. A few minutes later when we dropped back, the lead group was splitting up a small climb and as Alex Higham piled on the pressure with Murray and Dylan in close attendance. The rest meanwhile were losing ground and the bunch was visible in the background. The gap was obviously tempting for a few in the bunch as they jumped across and the group swelled to 10 or so riders. New additions included Matt Stephens (Sigma Sport), Andrew Roche (Pinarello), Ian Wilkinson and Dave Collins (SiS/Trek), three from Recycling.co.uk -- Ryan & Adam Bonser and Graham Briggs, Richard Skyes-Popham (Glendene CC) and another from KFS Special vehicles, Gary Hand. Dropping back a bit further, and another group had formed with Mat Talbot (Rapha Condor), Tom Diggle (Recycling.co.uk), Neil Swithenbank (ABC Centreville), Rob Partridge (Recycling.co.uk), and Alistair Kay (York Cycle Works) among their number. And behind that, more groups and a lined out peloton – the race had the gas turned up full and we still had over a hundred miles to go! Laving them to it for a few minutes, the next time we went back and Jason Allen was lighting the fuse for Plowman Craven back in the bunch with Gordon McCauley on his wheel and Russell Downing making sure he wasn’t missing this group. After witnessing much exploding of the peloton, and chewing of the handlebar tape as riders struggled to remain in the race, we headed back to the front of the race where the pace was more steady as most of the riders in the group took turns to at the front of the break. With so much going on, we continued to flit back and forth between break and chasers and when we returned to the bunch, a few of the small chase groups had come together and riders were now looking at each other to see who was going to be next to chase the break down whilst the rest of the bunch could be seen in the distance. Meanwhile at the front, trouble for Tom Murray and a puncture was soon taken care of by neutral service. The chase behind continued to be frenetic and the group of 20 plus riders was being attacked by Ben Greenwood back from Italy and Chris Newton. After that skirmish settled down, Freddy Johannson from Plowman Craven was next to try and when that didn’t work, Scott Gamble (Ashfield RC) had a go. All in the space of a few minutes! As tempting as it was to sit there and capture all this on camera, we didn’t want to upset those in control of the race, ie, the commissiares and so we went back to the front. You could tell the gap was growing for the break because the team cars were now behind them. The chase through was never ending and soon the first of the two ‘pelotons’ was split into three as Ben Greenwood, Russell Downing, Robin Sharman, Rob Partidge, Tom Diggle, Neil Swithenbank, Matt Talbot, Matthew Kipling, Gordon McCauley, Chris Newton, Scott Gamble and others had pulled a group of almost a dozen riders clear. As Ben Greenwood and Russell Downing pressed hard on the pedals up a climb, the group started to stretch out back down the hill. The elastic though was never broken and the chase group soon had the convoy from the break in their sights. We pushed on to the break only 30 seconds up the road now and sure enough the cars in the convoy were being pulled out. Then after half an hour when the expected coming together didn’t happen, the team cars returned as the break had pulled their lead out to back over a minute. The chase group finally got their act together, minus a few riders from earlier on, and were soon in sight eating into the lead of the break again. As they closed in on them, this was probably one of the most telling points of the race because as Matt Stephens continued to attack prior to the junction being made, the riders from the break and chase group were now really starting to hurt and the faces on the likes of Graham Briggs, Ben Greenwood and others said it all as the two groups were now spread out in ones and twos across a 30 second gap. As the chasers caught the break, so many faces on the riders spoke of impending doom as their legs were so close to exploding once and for all as the pace never relented as Stephens, Downing, Swithenbank and others drove the pace higher and higher. The skirmishes continued apace and then after some more digs up the never ending ups and downs on this course, a select group started to form with Stephens keen on making sure whatever happened, the lead group was not going to be very big at the end of all the attacks and counter attacks! It took a while to settle down as various combinations formed and then were exploded by Stephens and the other riders with something left in their legs. 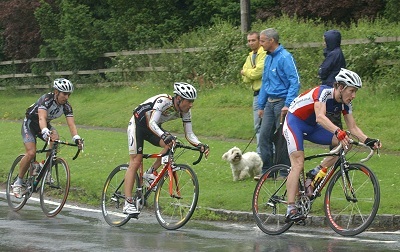 Stephens however, a former professional who competed in the Tour of Italy and is now a policeman was in outstanding form and it was a privilege to be there to see him dismantle the leading group attack by attack in tandem with Downing. After a frenzied period of 15 minutes or so, we went back to take another look and the race had been settled and three of the strongest were away, Stephens, Downing and Newton. Their lead was small to begin with and stayed so for a half an hour but then the gap just opened up and from 50 seconds, to a minute and very quickly two minutes. There was still 50 kilometres to go when they got away and as the riders explained later, three was better than two so it was only a matter of who would win from the three because even a puncture for Chris Newton didn’t break the lead group up. There was of course going to be some attacking between them as they neared the finish but it was a battle we did not witness as to do so would have meant missing the finish. Afterwards we learned it was Stephens, well known for his lack of a gallop, who attacked from the trio first and just as Downing pulled him back, Newton countered. It was all over for the other two as Newton, a pretty handy time trialist as befits a former World Team Pursuit champion, held Downing at bay, piling on the pressure and nothing Downing could do was enough to close the gap. And so it was Newton who crossed the line 13 seconds ahead of Downing with Stephens trailing in third after a fantastic race by the Sigma rider. Matt Stephens (3rd): “I have been feeling a bit better the last few weeks, the strength is there, and as ever I tried to get in the early move so I’m not spending the race chasing. The early move this week was a bit better and a bit easier than last week. Everyone was riding which gave me more time for recovery. 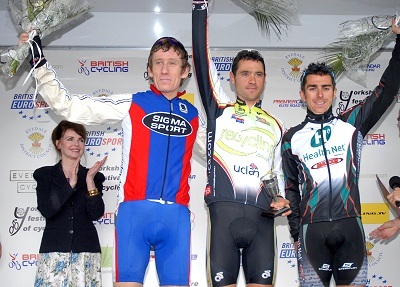 When the junction was made with Russ Downing’s group it was just a bit of a mess. I don’t like it when you have these 20 or 30 rider unwieldy groups with guys sitting on, I get a bit frustrated, so I had a few digs”. “So I thought I’ll have a breather and try again but he had the gap and that was it. So it was a good ride by him and Matt was going really well today. It was a brilliant race. Early on everyone was panicking about the distance and it was hard and even harder to read because you didn’t want to miss something”. Thanks to everyone, riders and organisation for a great race!